Iceland's tourism industry is asking visitors to do some studying before they arrive in an attempt to make sure they act safely and responsibly during their travels. Promote Iceland, a public-private partnership, is launching an online "academy" where tourists can sign up for short tutorials offering advice on everything from responsible conduct to driving and packing warm clothes, the Iceland Review website reports. There are also cultural primers, including a course on "how to avoid hot tub awkwardness". The campaign is less about increasing visitor numbers, and more focused on people's behaviour during their trip, while maintaining an element of fun, according to public broadcaster RUV. It follows a spate of recent incidents in which tourists have been accused of acting recklessly. Earlier this month, dozens of people were spotted on a closed, snow-covered path leading to the Gullfoss waterfall, having apparently climbed over warning signs blocking the entrance. 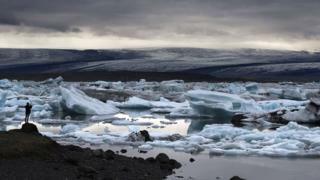 On Thursday, a group of tourists ventured onto floating chunks of ice at Jokulsarlon glacial lagoon in south-east Iceland, the second group to do so in a week. But MPs have pointed out that some sites lack adequate warnings of the potential dangers. "The majority of tourists want to experience nature, and we know that Icelandic nature must be treated with respect and care," says Inga Hlin Palsdottir from Promote Iceland. "We believe that if the traveller is better informed of conditions ahead of time, he or she will get more out of the trip and leave the country happier."